Through our aim to engage 1 million kids over the 2019 World Cup, we’re inviting clubs across the country to become a Cricket World Cup Club and 'be part of the World's Greatest Cricket Celebration!' 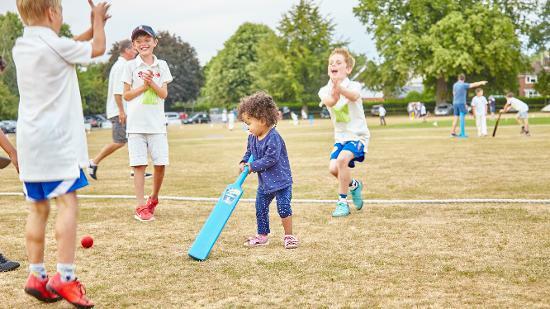 Put on a family day at your club across 7 - 9 June 2019 and engage a new audience through the excitement of the Cricket World Cup. The entries for the PCA England Masters game has now closed. We will announce winner shortly. This opportunity is open to all clubs, all centres, all communities – and it’s easy to get involved. We’re asking clubs to run a day or weekend of family-based activities across 7 - 9 June to better connect with the local community and engage the younger generation. The aim of these family days is to get more kids involved in the game and to help clubs showcase themselves to a wider audience. Bouncy castles, face painting, clowns etc. You’ll have access to official marketing material to assist with the promotion of your event – we’re hoping you’ll be able to use this material in schools, on social media and in the local area! In addition, the first 3,000 clubs that register will receive a Marketing Booster pack with Cricket World Cup posters and bunting. We’ll also provide you with guidance on how to prepare for and run your Family Day and supply you with Cricket World Cup wristbands for the kids that attend your day. In addition, we've created a Cricket World Cup Club Fund where the first 2,350 affiliated clubs that apply can receive £1,000. The Fund is designed to support clubs by improving their digital capacity or catering provision, to assist with their family day and enhance the World Cup experience. The funds will be allocated on a first come, first served basis and you can download the separate application form here. Please note that by becoming a Cricket World Cup Club, this does not automatically mean your club has applied for the £1,000 Cricket World Cup Club Fund. This is a separate process for affiliated clubs only - please read all information on the Club Fund page before submitting your application. What if we are a non-traditional cricket organisation or unaffiliated club? The programme isn’t just for traditional cricket clubs - we want as many organisations and communities associated with cricket involved as possible. Whilst the Cricket World Cup Club Fund is only available for clubs that meet certain criteria, everyone is welcome to register to join in the celebration, use the marketing assets and make the most of the opportunity next year presents. What is an affiliated club? Cricket clubs have the opportunity to be affiliated to ECB via their local County Cricket Board which brings multiple benefits. If you would like your club to be eligible for the Cricket World Cup Fund, speak to your local Board about their process. The main weekend of activity will centre around the weekend of 7 – 9 June 2019, however you can select any weekend within the ICC Cricket World Cup schedule that suits your club best. ‘Be part of the World's Greatest Cricket Celebration’: run your event and bring the excitement of the Cricket World Cup into your clubhouse!